Today I received the letter informing me that I had passed the épreuve spécifique of the exam for obtaining the PPL(A) under Part FCL. It was the second attempt I took for this part. I got 68 multiple-choice questions right out of 72; the minimum required to pass being 54 (75%), whereas in the previous attempt I had gotten right 51, short of 3. Sure, this time I studied a bit more and practiced more with tests. However, I wanted to share in this post, as a tip, what I understand it was the key difference: Chez Gigli. 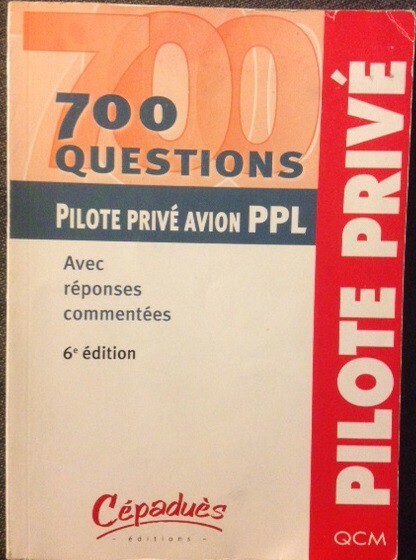 For the first exams I took, back in November I based my study in the manual edited by Cepadues and a book including 700 exam questions with the explanations of the correct responses. This worked relatively well. However, the version of the book I had dated from before Part FCL was introduced (replacing JAR FCL) and thus the topics are organized in 5 exams (vs. the current two). PPL exam questions book by Cepadues. For the second attempt I bought a 1-month access to Chez Gigli as my instructor had recommended years ago and my friend Rapha had mentioned, too. The cost of the book from Cepadues is ~25€, whereas the 1-month access to Chez Gigli costs 20€, for longer time more, though there are discounts (life-long access being 90€). However, the way Chez Gigli is organized is terrific. You can record your previous results, focus on and review the questions you got wrong, practice only among questions you never saw before, focus on actual exam questions, last year questions, etc. You can see the progress of your scores per topic. Your tests are timed. Explanations of the correct answers are very good and there is a forum per each question so students can ask doubts or further clarifications. It is way more powerful than a book. And you notice it as long as you get to see all the questions, focus on your mistakes and correct them. You get in a matter of days from scores of 70% to 95-100%. 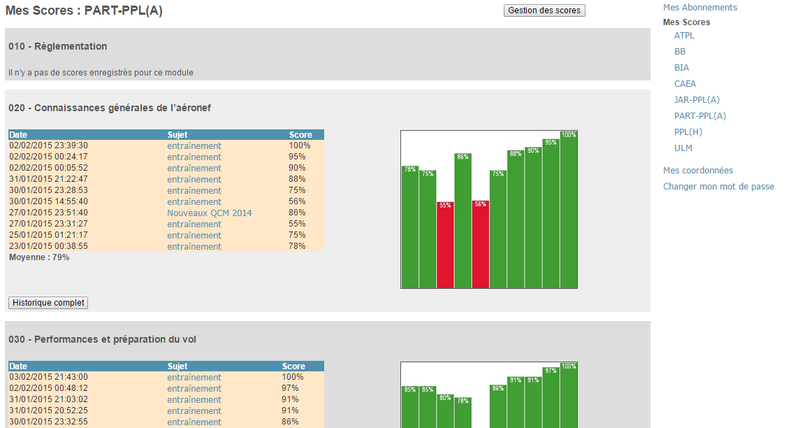 Scores’ dashboard in Chez Gigli website. While I was doing the last exam I felt way more comfortable. In most of the questions I didn’t even need to think. Just in a few of them I had some doubts between a couple of answers. 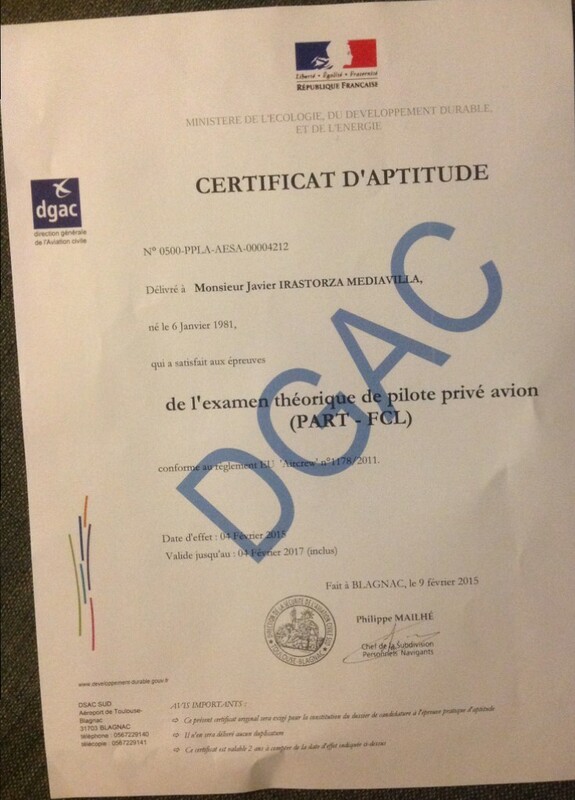 I completed the exam way faster than needed, more relaxed and the result, 94.4%, was a success, as the practice had gone. Thus, if you are in France preparing to get your PPL, do not give it a thought: sign for a subscription to the website.